On December 14, 2012, we shared in the sadness and grief that consumed parents and children everywhere as we were unfortunate enough to witness a horrific event at Sandy Hook Elementary School in Newtown, Connecticut. We mourned the loss of the adults and the young children who were victims of the senseless act that took their lives. We found comfort in the words of Fred Rodgers: "When I was a boy and I would see scary things in the news, my mother would say to me, 'Look for the helpers. You will always find people who are helping.' To this day, especially in times of 'disaster,' I remember my mother’s words, and I am always comforted by realizing that there are still so many helpers - so many caring people in this world." Six-year-old Catherine Violet Hubbard was one of the children killed that day in Newtown. 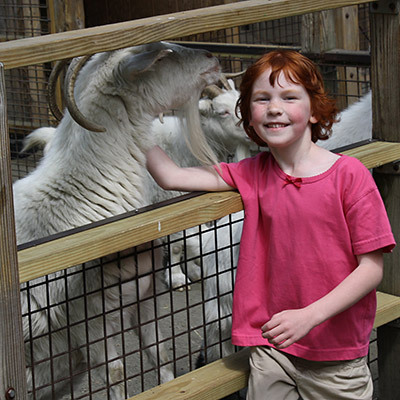 A lover of all animals, Catherine made it a point to show them extraordinary compassion. She told her parents that when she grew up, she was going to take care of the animals. Determined to make this dream a reality, she created her own business cards for “Catherine’s Animal Shelter.” Catherine was the self-appointed “Care Taker.” When we heard the news that Catherine's parents, Jenny and Matt, were working to make Catherine's dream come true, we couldn't wait to get involved. We're proud to do what we can for The Catherine Violet Hubbard Animal Sanctuary through our Make Nice Mission. Join us below as Jenny Hubbard takes us on a tour of the sanctuary and gives us a look at what's to come. Read about our two contributions to the CVHAS education program and use them to bring Catherine's mission home to your families. We're thankful to Jenny for taking the time to share Catherine's dream with us, and we're thankful to Catherine for dreaming so big. Catherine’s heart was devoted to caring for animals. She used her money from recycling bottles to buy a box of dog biscuits for the Animal Control Center, and left out food for the cats she assured us lived behind our home. I would watch her as she would cup a butterfly in her tiny hands and whisper to it as it took flight. She would tell us it was going to tell its friends she was kind and they would come back. Not surprisingly, we would be mesmerized by the flocks of butterflies that fluttered through our gardens. She told us one day she would care for all the animals. Sadly, her gentle whisper was silenced on December 14th. A gunman took the lives of six adults and twenty children at Sandy Hook Elementary. Catherine was among the children killed. So much was lost that day. We lost our daughter, our son lost his sister, the world lost its innocence. However, in the time since her death we have found things. We have found love, support, kindness, and community. We have found hope and a new purpose. We are Catherine’s butterflies. We are her messengers. We carry her voice, her hopes and her dreams and will create the Catherine Violet Hubbard Animal Sanctuary. It will be a place where her kindness will be felt not only by all creatures, but also by every person and community it touches. When the sanctuary buildings are created, the first structure you will encounter will be a pavilion with red terra cotta tiles- the only structure with such tiles. Reaching out from the pavilion are two colonnades stretching to the main building on the left and to the veterinary intake on the right. The pavilion (the gateway to the Sanctuary) represents Catherine: the tiles her hair, the colonnades her arms welcoming humans and animals alike. 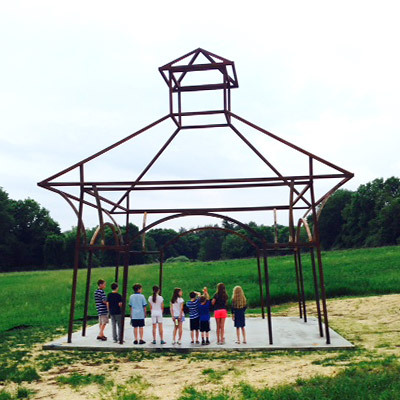 A pavilion sculpture, an exact replica of the frame for what will come, emerges from the meadows as you approach the top of the tired farm road. The pavilion stands watch over this sacred space, a beacon of hope, and embodies the beauty, optimism and purity of all that lies ahead. It's our privilege to share what we hope Catherine thinks is the most beautiful place on earth with you. The Sanctuary once supported, in part, the State Psychiatric Hospital at Fairfield Hills in Newtown, CT. The parcel is known for its soils being optimal from years of potato farming and still includes a three-story bank barn that once housed chickens and other small farm animals. 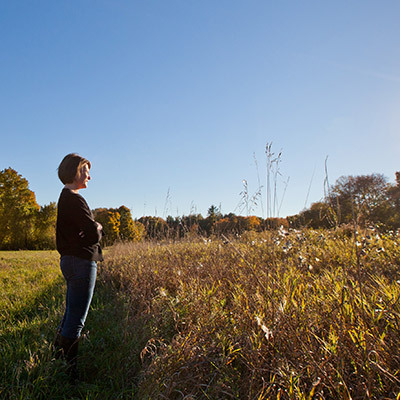 After the hospital closed, the property stood vacant and invasive plants began to encroach on its lush meadows. And still in its grandeur, it began its mission as a sanctuary. 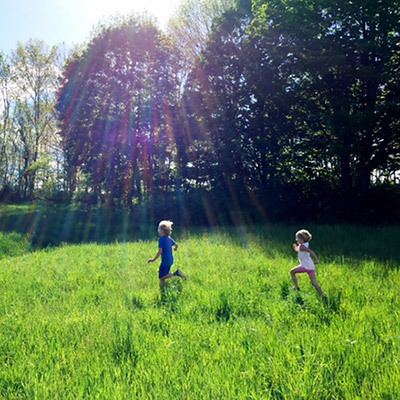 As you hike the trails, you might spy a fawn that had found shelter in the tall meadows, or butterflies delighting in their dance as the swallows swoop from tree line to tree line. Every so often, a cottontail may dart in front of your feet as it rushes into its burrow. The expansive meadows and woodlands provide quiet retreat to all creatures great and small. As stewards of the Sanctuary property, we pray every decision we make demonstrates the value we place on its innate beauty. With the guidance of the local Audubon Society, Cornell Veterinary Medical College, the ASPCA and Jane Goodall Institute, we look to make decisions that support the long-term sustainability of the sanctuary. Over the past year we have worked with the University of Connecticut’s Invasive Plants department to develop and begin to implement an invasive plant management plan. 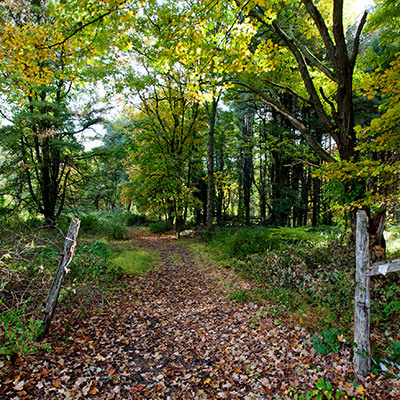 The Newtown Bridle Lands Association in conjunction with the 2nd Governor’s Horse Guard has worked tirelessly in re-establishing 1.5 miles of equestrian trails that weaves through the Sanctuary’s forest. Photo Credit: © 2015 Marleen Cafarelli. The Catherine Violet Hubbard Animal Sanctuary will provide state of the art care for its' animal residents, hands on educational programming for the community, and volunteer opportunities for those looking to share their time and knowledge. It will be a place where animals whom have become displaced after caregivers have no longer been able to provide, will find shelter. We will work to bridge the gap during these times so that both the human and pet receives the medical and supportive care they need. Our veterinary intake facility will not only be a place where on site animals are cared for, but a resource for the animal rescue community. For many non-brick and mortar rescues, transport or foster families meet in parking lots. Our Sanctuary will offer rescues and their animal’s use of the Veterinary Intake as an alternative. The barn will be restored and will be a safe haven for abused, neglected or abandoned farm animals; a place where pigs, sheep, goats and other farmed refugees can live the remainder of their days unconfined and free from harm. One of the last books Catherine and I read together was Charlotte’s Web. My hope is that the barn is a small reflection of the community captured on E.B White’s pages. Our hope, long term, is that by working with local wildlife rehabilitators, we will be able to provide a crucial community service and offer emergency medical care and temporary housing for injured and orphaned indigenous wildlife. Determined to not wait until we have a building to help animals, we will continue to host community adoption events like we did at Catherine’s Butterfly Party and are working with DAWS, a local animal rescue, to develop a program that will find foster homes for senior dogs and cats in their care. Photos Courtesy of Jenny Hubbard. The Sanctuary will be a place for community to connect, share, learn and grow. A perfect rectangle where the potatoes were once farmed, will be re-established and serve as a community garden. Raised beds will be a place for community to connect or for children to participate in Junior Master Gardening classes. They will experience the true meaning of farm to table as the fruits of their labor are transformed in the Sanctuary’s culinary kitchen located in the main building. The main building will serve as home to all our education and community activities. Whether it’s a visiting animal related artist encouraging budding writers and artists, or a student wanting a quiet place to do homework, Catherine’s library will offer a peaceful enclave to all learners. People will be able to participate in workshops as they learn how to care for the animals we share this earth with. Native butterfly gardens and tree houses providing birds eye views will encourage imaginations to explore and dream. 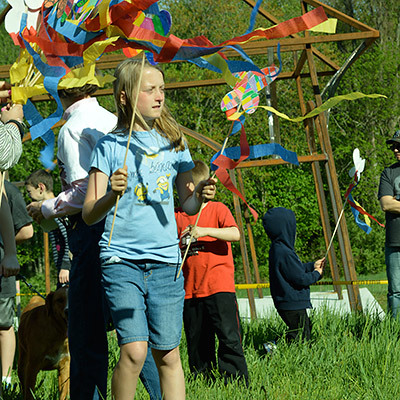 We envision the Sanctuary bustling with opportunities to volunteer or engage in its programs. In working with the community on ways in which to care for animals and the environment, we believe we help communities grow in compassion and acceptance and in turn make the world a little kinder and gentler for all. We are preparing to begin the regulatory process in 2016 and hope to start construction in 2017. And though we do not have four walls and a roof, we have already begun to welcome children of all ages as they learn what it means to be a veterinarian or dog groomer. 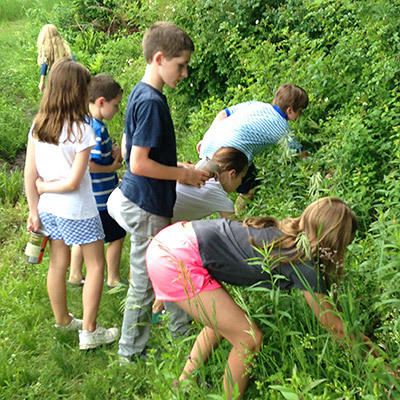 Elementary school students released their classroom butterflies in the sanctuary meadows as they closed out their science unit. Our guided hikes, art classes and our workshops provide a small glimpse of the beauty that has already begun to emerge. In all we do, we take our lead from Catherine. Her pure and simple love for people and animals is at the heart of everything. We hope anyone entering this sacred space, they will know here they are safe and humans are kind. We hope children will know compassion, and see their own innate beauty in the eyes of a lamb, deer or kitten. Here, we hope the world sees how peace begins: through love, respect and kindness. Here, at the Catherine Violet Hubbard Animal Sanctuary we will all heal, together. As part of our Make Nice Mission, we've created a craft to add to the Catherine Violet Hubbard Animal Sanctuary's educational program, and designed a little something to add to their Cups of Kindness campaign. If you aren't able to take a trip up to the sanctuary yourself, use these crafts and ideas with the children in your home and take part in the program from afar. Start thinking about the animals in your backyard and the different ways we can help them live a happier, safer life. Help your kids to do their part to for the Catherine Violet Hubbard Animal Sanctuary by holding a Cups of Kindness Stand, spreading the word about the program and sanctuary, and learning about the importance of caring for the animals in our world. The butterfly was one of Catherine Violet Hubbard's favorite animals. 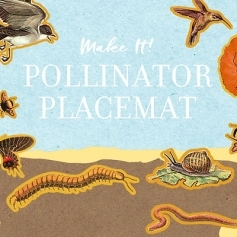 We created a Pollinator Placemat for the team at the Catherine Violet Hubbard Animal Sanctuary to use in their educational program. Cups of Kindness is an initiative that encourages people to raise money for the Catherine Violet Hubbard Animal Sanctuary. 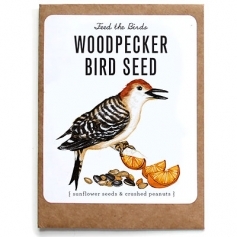 We've created custom bird seed packets to sell at a Cups of Kindness event to raise money and awareness for the animals. Using our five senses to explore the garden.